Used plastic shopping bags can be converted into petroleum products that serve a multitude of purposes. CHAMPAIGN, Ill. - Plastic shopping bags, an abundant source of litter on land and at sea, can be converted into diesel, natural gas and other useful petroleum products, researchers report. 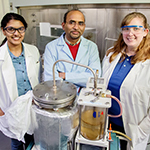 Brajendra Kumar Sharma, center, a senior research scientist at the Illinois Sustainable Technology Center at the U. of I., with research chemist Dheeptha Murali, left, and process chemist Jennifer Deluhery, converted plastic shopping bags into diesel fuel. The conversion produces significantly more energy than it requires and results in transportation fuels - diesel, for example - that can be blended with existing ultra-low-sulfur diesels and biodiesels. Other products, such as natural gas, naphtha (a solvent), gasoline, waxes and lubricating oils such as engine oil and hydraulic oil also can be obtained from shopping bags. A report of the new study appears in the journal Fuel Processing Technology. There are other advantages to the approach, which involves heating the bags in an oxygen-free chamber, a process called pyrolysis, said Brajendra Kumar Sharma, a senior research scientist at the Illinois Sustainable Technology Center who led the research. The ISTC is a division of the Prairie Research Institute at the University of Illinois. "You can get only 50 to 55 percent fuel from the distillation of petroleum crude oil," Sharma said. "But since this plastic is made from petroleum in the first place, we can recover almost 80 percent fuel from it through distillation." Americans throw away about 100 billion plastic shopping bags each year, according to the Worldwatch Institute. The U.S. Environmental Protection Agency reports that only about 13 percent are recycled. The rest of the bags end up in landfills or escape to the wild, blowing across the landscape and entering waterways. Plastic bags make up a sizeable portion of the plastic debris in giant ocean garbage patches that are killing wildlife and littering beaches. Plastic bags "have been detected as far north and south as the poles," the researchers wrote. "Over a period of time, this material starts breaking into tiny pieces, and is ingested along with plankton by aquatic animals," Sharma said. Fish, birds, ocean mammals and other creatures have been found with a lot of plastic particles in their guts. Whole shopping bags also threaten wildlife, Sharma said. "Turtles, for example, think that the plastic grocery bags are jellyfish and they try to eat them," he said. Other creatures become entangled in the bags. 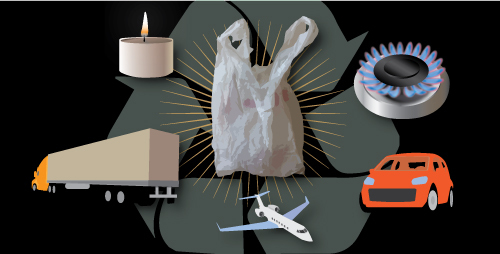 Previous studies have used pyrolysis to convert plastic bags into crude oil. 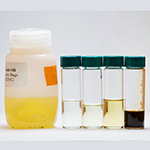 Sharma's team took the research further, however, by fractionating the crude oil into different petroleum products and testing the diesel fractions to see if they complied with national standards for ultra-low-sulfur diesel and biodiesel fuels. "A mixture of two distillate fractions, providing an equivalent of U.S. diesel #2, met all of the specifications" required of other diesel fuels in use today - after addition of an antioxidant, Sharma said. "This diesel mixture had an equivalent energy content, a higher cetane number (a measure of the combustion quality of diesel requiring compression ignition) and better lubricity than ultra-low-sulfur diesel," he said. The researchers were able to blend up to 30 percent of their plastic-derived diesel into regular diesel, "and found no compatibility problems with biodiesel," Sharma said. "It's perfect," he said. "We can just use it as a drop-in fuel in the ultra-low-sulfur diesel without the need for any changes." The research team also included Bryan Moser, Karl Vermillion and Kenneth Doll, of the USDA National Center for Agricultural Utilization Research, in Peoria, Ill.; and Nandakishore Rajagopalan, of the ISTC at the U. of I. The Illinois Hazardous Waste Research Fund and the Environmental Research and Education Foundation supported this study. To reach Brajendra Sharma, call 217-265-6810; email bksharma@illinois.edu. The paper, “Production, Characterization and Fuel Properties of Alternative Diesel Fuel From Pyrolysis of Waste Plastic Grocery Bags,” is available online or from the U. of I. News Bureau.